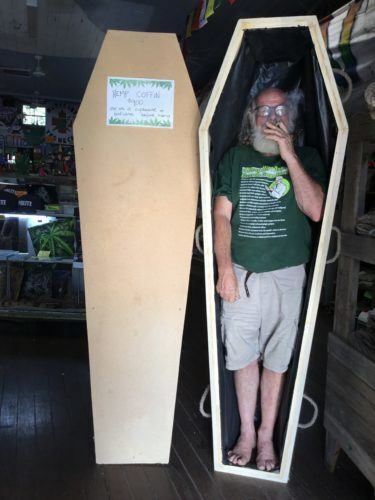 “I’ve got three on site at the moment that are made,” says Michael Balderstone president of the HEMP Embassy in Nimbin, a small town in northern New South Wales, where the caskets are designed, built, and sold. 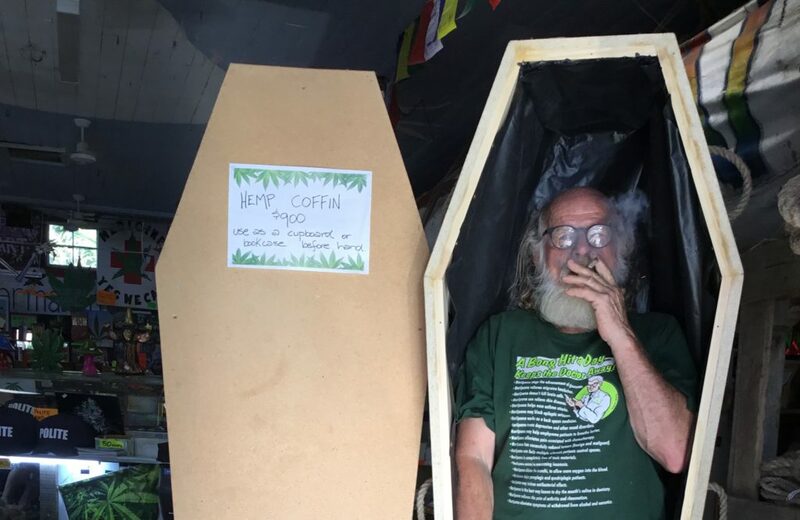 The coffins, which are built with a 19mm lightweight pressed hemp board from Germany and are lined with hemp rope handles, are usually colourfully painted by artists in Nimbin. The town, which hosted the 1973 Aquarius Festival, is Australia’s answer to Woodstock. 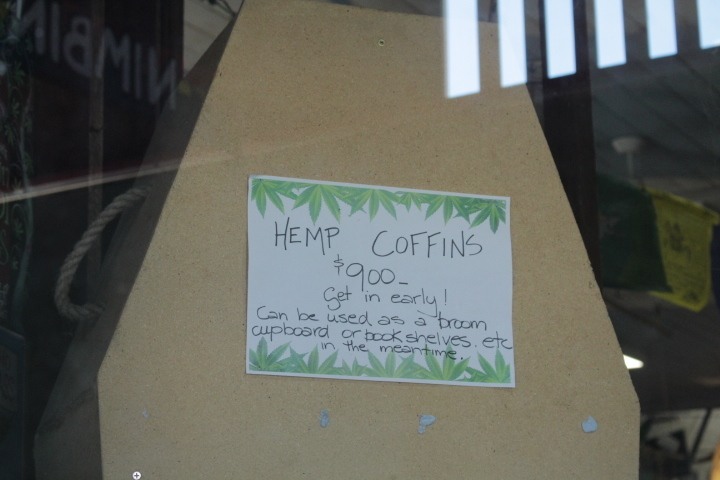 The hemp coffins cost only between $700 and $900, he says. That’s similar to the cost of a regular coffin, but constructed from sustainable materials that will biodegrade more quickly. “They are popular,” says Balderstone. And they’re also versatile, as a sign in the window of the HEMP embassy highlights. “Can be used as a broom cupboard or book shelves etc in the meantime,” it reads. According to small-scale manufacturer Rawganique, which makes hemp products, local demand for its willow-hemp caskets and coffins “is more than enough” for its single artisan workshop located on Denman Island, British Columbia. Their products feature organic hemp ropes, come in a variety of colors, are chemical and fertilizer-free, and completely biodegradable. Meanwhile, hemp burial shrouds are also available through Australia-based Life Rites. The Australia and New Zealand Food Standards Code has allowed the sale and consumption of low-THC hemp seed foods since November 2017. The move was described as a “landmark” by the not-for-profit Australian Industrial Hemp Alliance (AIHA). The Nimbin HEMP Embassy, formed in 1992, aims to educate people about the integration of hemp in people’s lives. The Embassy runs a shop and information centre “to fund our protest” against Australia’s cannabis laws. Its shop displays everything from a hemp surfboard to a hemp bees-wax food wrap, while its hemp bar offers a range of hot beverages and desserts containing the plant. Other restaurants and shops nearby also sell hemp products. Balderstone is also president of Australia’s federally-registered HEMP Party, which will contest in the upcoming election in May. According to reports, Australia is one of highest users of psychoactive cannabis (“marijuana”) in the world, even though recreational use of cannabis is criminalized there. Medicinal marijuana is legal in the country. 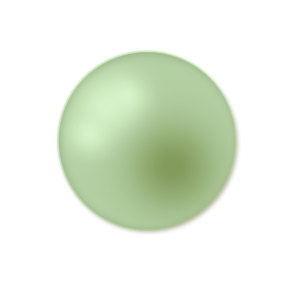 Pearl Green is the pseudonym of an Australian freelance writer who covers lifestyle, human rights and other issues.